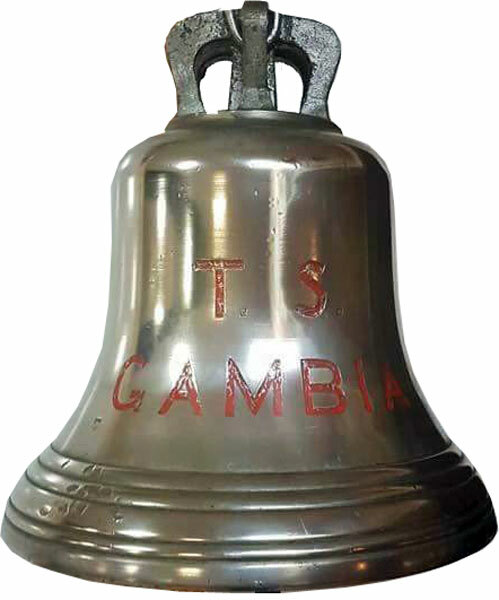 In May 1957, Gambia sailed again for the Persian Gulf station, as the last flagship on this station, and returned to Rosyth on 19 September 1958. On 4 November 1958 she recommissioned for the 1st Cruiser Squadron in the Mediterranean. She deployed to the Far East on 4 December 1959 to relieve the cruiser Ceylon in the Red Sea. 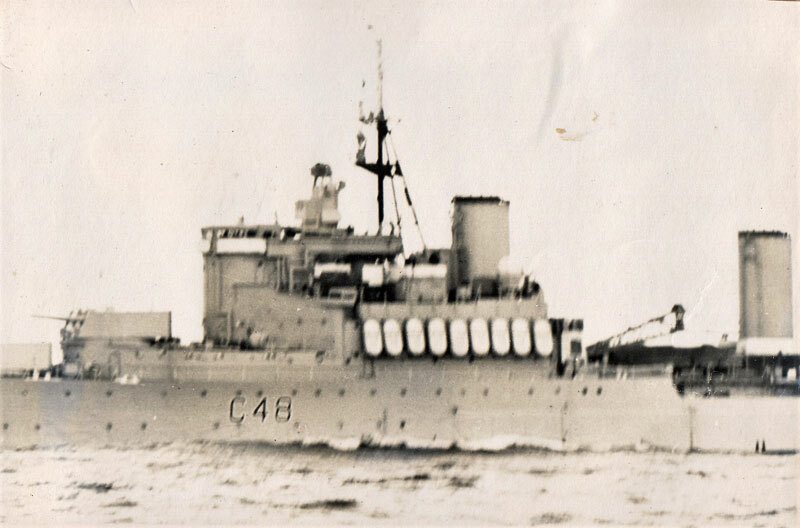 HMS Gambia returned to the UK via South Africa with a visit to Freetown and the Gambia, before arriving in Portsmouth in July 1960. An unusual photo of HMS Gambia. What makes this unusual is that I received it in September 2018 from Sergey who has a Russian email address and he said the photo was taken from one of the Soviet intelligence gathering AGI (Auxiliary, General Intelligence) trawlers. The trawlers were deployed to the Western Atlantic from the Kola region naval base of Murmansk and Sergey thinks the ships met each other around May/June 1960, close to UK waters. 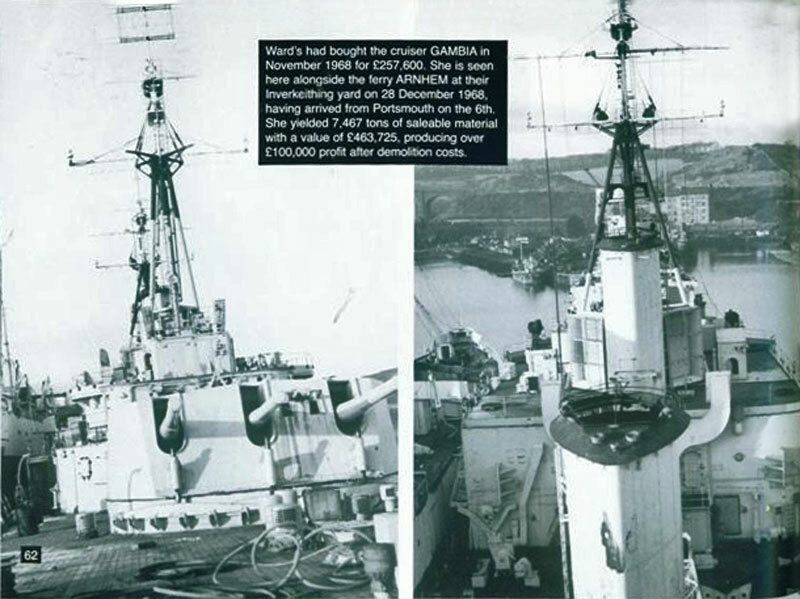 For the last months of 1960 she served in the South Atlantic and the Home Fleet before entering the reserve in December of that year, her crew largely going to the new cruiser Blake. 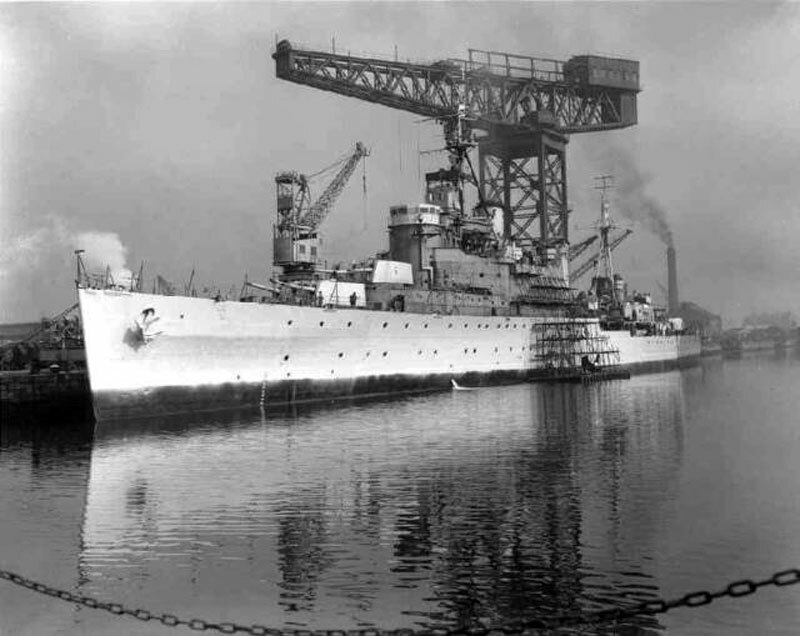 Gambia was paid off to reserve in December 1960 and she remained at Portsmouth until she was put on the disposal list and sold to Thomas W. Ward for scrapping. 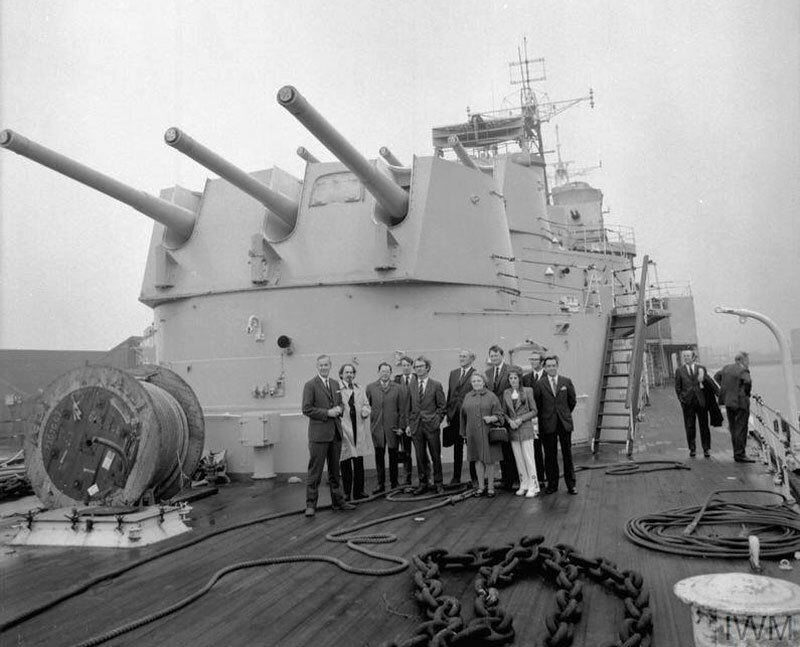 I'm not sure how true this is, but several people have told me that at least some of the guns on HMS Gambia were scavenged to replace the rusting ones on HMS Belfast. She was towed out of Portsmouth on December 2, 1968 and arrived at Thomas A. Ward Breaking Yard, Inverkeithing for breaking up on December 5. Ward's had purchased Gambia in November 1968 for £257,600 She was finally broken up in 1969 and yielded 7,467 tons of saleable maerial valued at £463,725. This gave Ward's £100,000 profit after demolition costs. 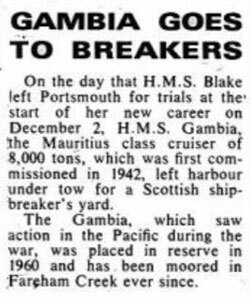 The Gambia, which saw service in the Pacific during the war, was placed in reserve in 1960 and has been moored in Fareham Creek ever since. Most the crew who served on HMS Gambia's last commission was transferred to HMS Blake. 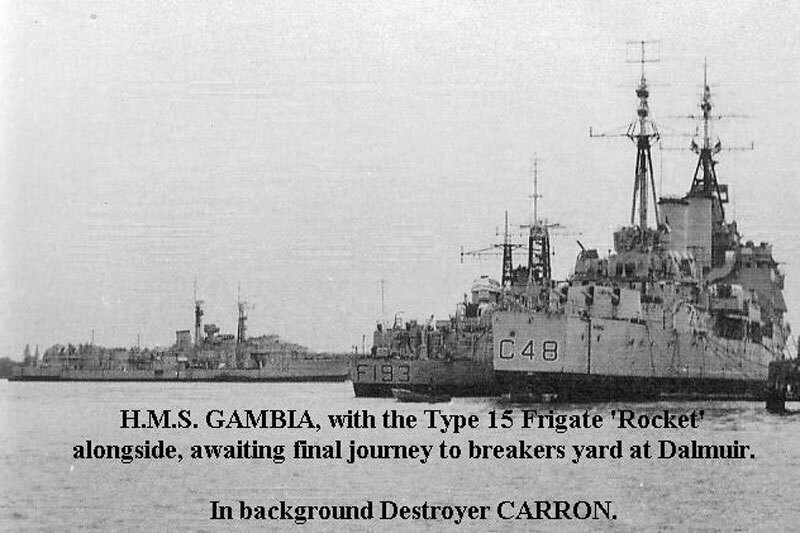 HMS Gambia with the type 15 frigate, HMS Rocket alongside awaitingthe final ourney to the breakers yard at Dlmuir. In the background is the destroyer HMS Carron. This wasn't quite the last that was heard of HMS Gambia though. Steel from warships were used for these facilities. 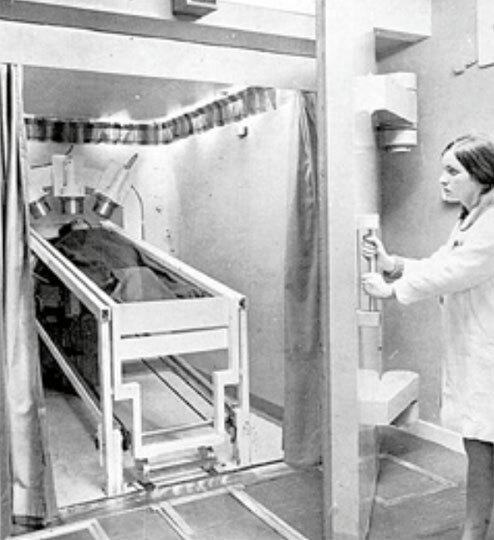 The whole body monitor at the Radiobiological Research Laboratory, now the Defence Science and Technology Laboratory(Dstl) at Alverstoke, Gosport in Hampshire was made from sections of the 150-millimetre-thick (5.9 in) steel plate recovered from HMS Vanguard when that was broken up in 1962. One of the reasons this steel was used was given in the National Security and Resilience - Defence Management Journal, Issue 31 and was because the pre-atomic bomb era steel ensured a very low background reading in the room. Training Ship Gambia, Otahuhu, South Auckland, New Zealand, was formed in May 1967 by Lieutenant Commander I.E. McLean MBE and Lieutenant M. St Clare, who both served on HMNZS Gambia during WWII. Lieutenant Commander McLean was appointed Commanding Officer. On the 6th of April 1972 Rear Admiral L.G. Carr CB DSC, the Chief of Naval Staff directed that Training Ship Gambia be commissioned for service within the Sea Cadet Corps, New Zealand Cadet Forces.